Instagram is prepping a new feature called Nametags, which will allow users to create a unique image that people can scan with the Instagram Stories camera to follow them, just like Snapchat's QR codes. While Instagram have a history of cloning Snapchat's best features, now it has extended to the friend codes, that allow it users to find new people to follow, with the Nametags making it easier for people to visually promote their Instagram account. 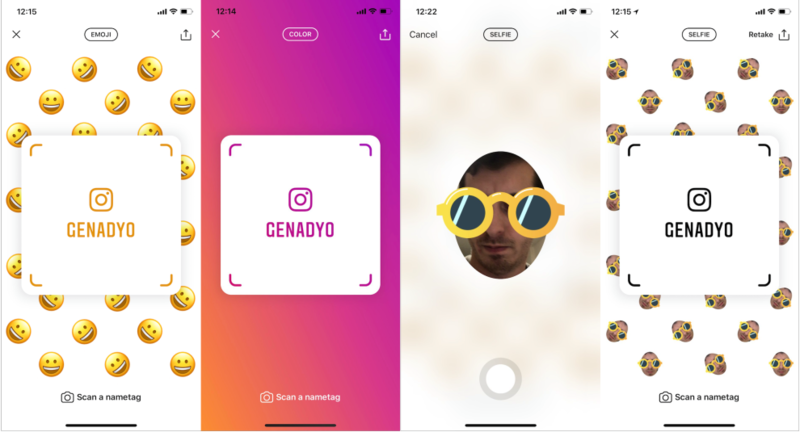 The feature was spotted on Instagram’s Android APK released last month, and thanks to Genady Okrain who has provided screenshots and more details of the Instagram Nametags feature. Also spotted is code for an Instagram Video Calling feature discovered in its Android APK, revealing a Portrait mode feature called Focus which is now in testing. Nametags will let users create custom tag using emoji patterns, and also can be based on the newly launched augmented reality selfies. And they’ll be able to bring up the Nametag editor by simply scanning a QR scanner button on their profile, then choose a pattern of emoji or a selfie they can jazz up with augmented reality face filters that then becomes an emoji pattern. However, as with all test features there's no guarantee that it will become available for everyone anytime soon.